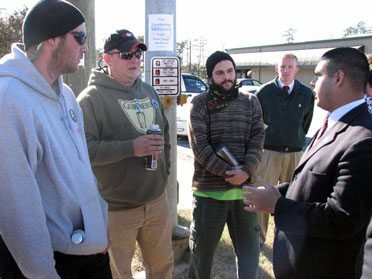 After an 818 mile drive from Pennsylvania to Georgia, eleven TFP Student Action volunteers reached Fort Benning. The purpose of the trip was to honor the troops at God Bless Fort Benning Day. On the same weekend of November 22, my colleagues and I witnessed a disturbing leftist protest lead by the School of the Americas Watch. Every year since 1990 an eclectic mix of anti-military protesters gathers at the gates of Fort Benning clamoring for the closure of the Western Hemisphere Institute of Security Cooperation (WHINSEC) once known as the School of the Americas. The institute trains Latin American officers to protect their respective countries against the ongoing threats caused by communist guerillas and narco-terrorists. 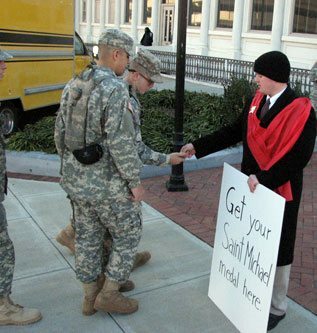 It was windy and cold on Saturday morning as God Bless Fort Benning Day activities got started. However, approximately 10,000 soldiers and local residents attended the event held in downtown Columbus, filling several city blocks on Broadway. U.S. Army vehicles and weapon exhibits attracted attention and children enjoyed taking turns handling the controls of the Stryker armored combat vehicle on display or watching Army Rangers demonstrate hand-to-hand combat skills. 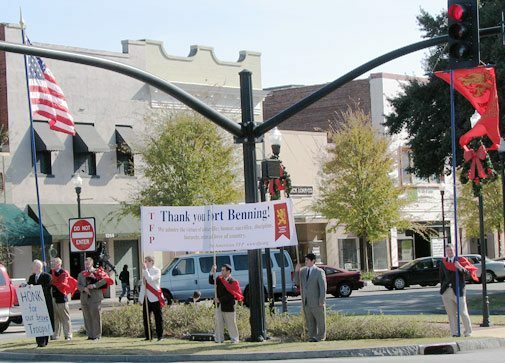 TFP Student Action members displayed a large banner, reading: “Thank you Fort Benning! We admire the virtues of military life: honor, sacrifice, discipline, hierarchy, order and love of country.” A printed statement titled Who Will Guarantee the Peace? was distributed and we also brought a good supply of Saint Michael Medals for the troops, depicting Saint Michael crushing the head of the serpent. There is a passage in the Apocalypse which describes Saint Michael and his angels defeating Satan during a decisive battle in Heaven. For centuries, Saint Michael has been the patron and protector of warriors and later, paratroopers and commandos. Fort Benning is home of the Army Airborne Jump School. Perhaps that is why soldiers treasured the medals so much: “Thank you, sir. Thank you very much. My commander uses one on his dog tags,” said one grateful soldier. Mr. Thomas Schneider held a sign offering the medals. Mr. Thomas Schneider held a sign offering the medals. He soon ran out. However, a group of soldiers in fatigues followed him to a nearby location where we kept a larger supply of medals. They wanted to make sure they each got one and some immediately went to work attaching the medals to their dog tags. Every soldier I met was respectful and courteous. It was refreshing to see so many young men in uniform serving their country, following the discipline and order of military life, committed to a purpose higher than themselves. Mr. Cesar Franco debating with protesters. When I entered the perimeter of the leftist protest, I met a chaotic mass of about 5,000 protesters. With the image of the clean cut soldier still fresh in my mind, I was jolted by the bizarre appearance of the protesters. What a striking contrast! Nose rings, body piercing, destroyed jeans, disheveled hair, filthy clothing, and distasteful tattoos abounded. My sense of smell was immediately assaulted by a barrage of disagreeable body odors giving me the sensation that I was walking among a horde of uncivilized tribesmen before the discovery of running water. The monotonous rumble of tribal drums was constant and smoke from sidewalk barbeque grills clouded the brisk air. “So, this is what the hippy revolution and Berkeley revolts of the 60’s must have looked like,” I thought to myself. On stage, a performer sung into the microphone, lauding the union of socialists, Catholics, anarchists and homosexuals. The number of nuns and members of religious orders in traditional habit intermingled with unkempt hippies was simply shocking. There was a large number of college students wearing T-shirts emblazoned with the names of prominent Catholic universities as well. Apparently, they receive college credits and a free ride. The SOA Watch program announces a presentation by Bishop Thomas Gumbelton. It also refers to Janice Sever-Duszynska, a woman in open conflict with Catholic teaching, as a “Catholic priest.” Moreover, the program advertises a new film featuring Fr. Roy Bourgeois and leaders of the SOA Watch movement. To my great surprise, the ad highlights how the film premiered on Islamic TV network Al Jazeera, the same network which broadcasted Bin Laden recordings after 9/11. What I witnessed made me understand that this protest is crafted as a recruiting tool of the left. It attracts radical homosexuals, pro-abortionists, environmentalists, Marxists, anarchists, atheists, hippies, liberal professors and dissident Catholics. “It’s a pity. But God told me to protest at Fort Benning,” she answered. “Did God tell you to wear ripped jeans too?” he inquired. “No. God does not exist,” she stammered. “The military profession is a noble occupation worthy of respect and honor,” said TFP volunteer Cesar Franco. “And Catholic doctrine supports the legitimacy of just war.” His remark did not settle well with the protester who flatly disagreed. “For example, don’t you think it was just for American soldiers to fight the Nazis?” asked Mr. Franco. “Do you support a cure for cancer?” asked Mr. Franco. “Sure I do,” answered the protester. The protester had no answer. There was another interesting exchange when one of my TFP colleagues asked a protester: “Are you against terrorists?” The protester refused to say yes. “Are you against Colombia’s communist FARC?” continued my colleague. “Oh, yes. I am against violence,” responded the protester. “Then you should be against terrorists because they are violent people,” said my colleague. The protester still refused to agree. This entry was posted in Events of 2008, Fighting the Culture War and tagged America, commando, Fort Benning, honor, I Saw Two Americas at Fort Benning, paratrooper, Patron, patron and protector of warriors, sacrifice, Saint, Saint Michael, Saint Michael medal, Saint Michael prayer, soldier, Western Hemisphere Institute for Security Cooperation (WHINSEC) by John Ritchie. Bookmark the permalink.